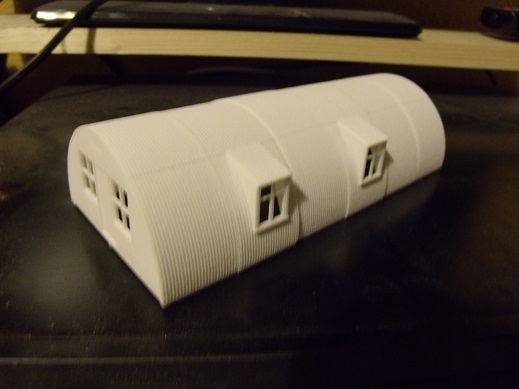 I have been doing some research on Nissen huts for a while, and now feel confident to produce something for 3D printing. There are already a number of models in smaller scales(I think Peco are now planning one) so more interested in bigger scales. 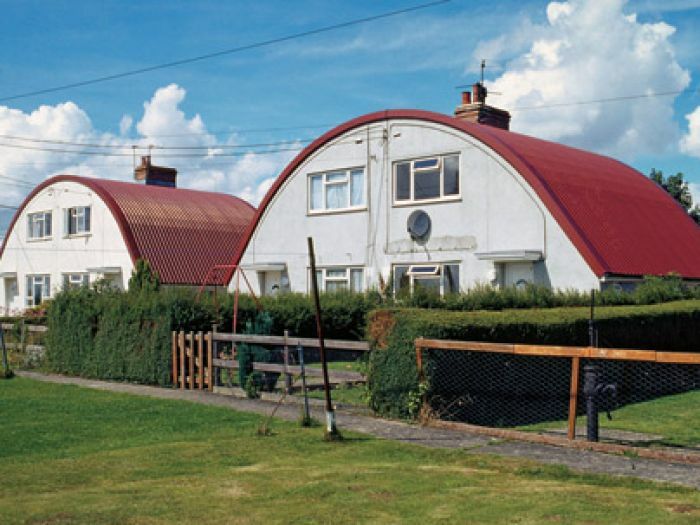 Although I had book on Quonset hut version, no decent drawing for Nissen hut , then found some online. Maybe because it is centenary of their introduction. I was looking for more info, was suggested a new site and found a photo of a house built to Nissen style. On further searches found it was 4 semi detached houses(ie 8 dwellings) built around 1925 in Somerset, not far from Fleet Air Arm museum,. Look like standard council house design(similar to Easyform one I live in, but with different roof, and semi detached. Might make an interesting model. I got stuck into design a while back. I managed to create sections for a small Nissen hut, with corrugations also on inside with a representation of the metal frames as well. This would mean they could be used for railway sheds. Just raise outer wlls and put Nissen hut on them. plhoto showing sections for 1/76 scale. I am also looking at othe scales. Apart from the side window panels I want a door version , also different front ends as later ww2 ones were normally brick. From the photos I have seen with news of the Ratio model, it looks like it might be one of the bigger Nissen huts. Willbe veryinterestin to see what they look like. Mine set up . 36ft long huts(6 sections) were fairly standard, but they could be a lot longer. I can print up to 3 or 4 sections in one go, beyond that file size is too big. Whatever liength I offer, someone will always ask for something different, so it might be easier to just wait to see what is asked for. These will be going on website soon.